Did you know that you can easily avoid period pains and PMS? Vanquish them for good. Find relief from bloating, breast tenderness, irregular menses, fatigue, irritability and cramping through homeopathy. 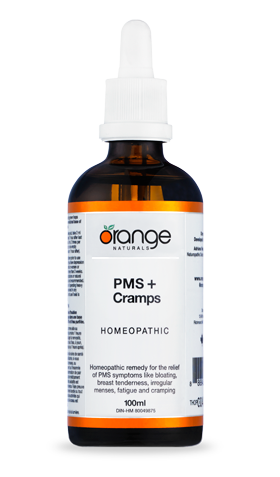 Orange Naturals PMS + Cramps homeopathic drops can be used either prophylactically before PMS sets in or acutely during your period. Let these drops be your secret weapon every month. Homeopathic remedy for the relief of PMS symptoms like bloating, breast tenderness, irregular menses, fatigue and cramping. Consult a healthcare practitioner prior to use if you are pregnant or breastfeeding. Consult a healthcare practitioner if you do not have a period beyond two cycle lengths, if you experience abnormally heavy or prolonged menstrual flow, if symptoms persist or worsen, or if new symptoms develop. Do not use if seal is broken. Keep out of reach of children.